A marvelously written work! Stout...offers stirring firsthand accounts of the strategies and doctrines that won the air war over Europe. When World War II began, the U.S. Army Air Corps numbered only 45,000 men and a few thousand aircraft--hardly enough to defend the United States, let alone defeat Germany's Luftwaffe, the world's most formidable air force. Yet by the war's end, the Luftwaffe had been crushed, and the U.S. Army Air Forces, successor to the Air Corps, had delivered the decisive blows. The Men Who Killed the Luftwaffe tells the story of that striking transformation--one of the marvels of modern warfare--while simultaneously thrusting readers into whirling, heart-pounding accounts of aerial combat. The Allies couldn't defeat Hitler's Third Reich without destroying its industry and taking its territory, but before they could do either, they had to neutralize the Luftwaffe, whose state-of-the-art aircraft and battle-seasoned pilots stood ready to batter any attackers. Great Britain's Royal Air Force was only barely holding the line, and the might of the United States was needed to turn the tide. Almost from scratch, the United States built an air force of more than two million men. Thanks to the visionary leadership of Henry "Hap" Arnold, Carl "Tooey" Spaatz, Ira Eaker, James Doolittle, and others, the USAAF assembled a well-trained and superbly equipped force unlike any ever fielded. And thanks to the brave Americans who crewed, maintained, and supported the aircraft, the USAAF annihilated the Luftwaffe as it pounded targets deep inside Germany and elsewhere. 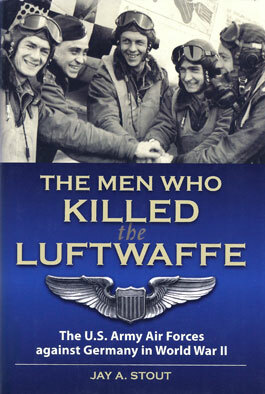 A stirring tribute to these men as well as an engaging work of history, The Men Who Killed the Luftwaffe vividly describes World War II in the skies above Europe. At the same time, it captures the personalities of the men who won it, whether on the ground or in the sky.